There are many questions to ask about what's to come in Star Wars: The Last Jedi, the eighth instalment in the Skywalker Saga. One of the characters with a lot of mystery surrounding where they go next is John Boyega's Finn. When we last saw Finn, he was unconscious on the Resistance Base on D'Qar. While it's safe to assume he will wake up, the real question is where does he go next. As a former First Order stormtrooper, he redeemed himself in The Force Awakens by helping destroy Starkiller Base, so where does he go from there? 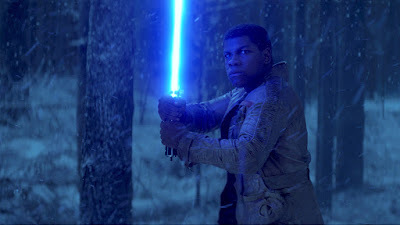 Our friends over at MakingStarWars.net have some new information about a new costume for Finn and what the implications are of that costume. As usual, there is is a chance this may not be true but if you are trying to avoid all The Last Jedi spoilers then stop reading now. This is your SPOILER ALERT! According Making Star Wars, we will see Finn go undercover in The Last Jedi as a First Order officer aboard a First Order Super Star Destroyer. The ship is depicted in concept art above the red planet planet that was rumored to be in the film earlier this week. The idea of Finn going undercover also ties into an older rumor about that Tom Hardy (Inception, The Dark Knight Rises) would make a cameo. The rumor was that Hardy would play a stormtrooper who recognises Finn and slaps him on the rear to congratulate him for something. While it was initially speculated that this was because Hardy's trooper thought Finn was spying on the Resistance for the First Order, it now appears that he is congratulating Finn on his perceived promotion. Given Finn's history with the First Order, it makes sense that he would become some sort of intelligence agent for the Resistance. It will be interesting to see Finn have to confront his past in The Last Jedi. Star Wars Episode VIII: The Last Jedi hits theaters on December 15th and stars Mark Hamill, Daisy Ridley, Adam Driver, John Boyega, and Carrie Fisher.